This startlingly realistic depiction of idle moments by the side of an alpine stream is composed of bravura brush strokes, dabs and daubs of bright colour. But it is a carefully contrived illusion, in every respect. 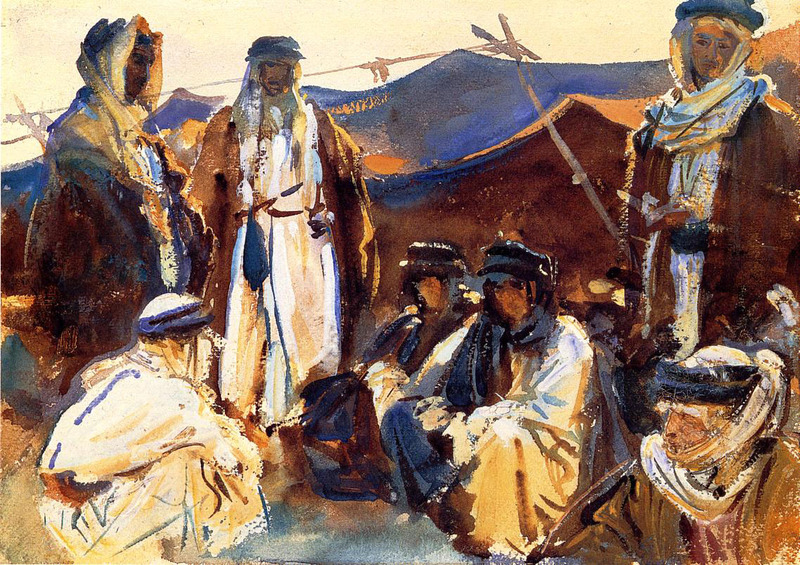 A group of six figures, three male and three female, dressed in a variety of Middle Eastern costumes, are seen idling time away beside an alpine stream. In the foreground, greatly foreshortened and cropped by the lower edge of the canvas, one lies asleep, her thighs marking the bottom of the canvas. A woman and man in the left half of the painting are engaged together apparently with a chessboard between them. In the right half, two men play chess, with a woman spectator sat between them and deeper into the view. Immediately behind the spread of figures the stream meanders in a lazy S from the middle of the left edge to the top of the right edge, scattered rocks visible on the distant bank. In the distance, on either side of the stream, the alpine meadow is rich yellow, gold, and light red with flowers, as it is in the immediate foreground. The painting is lit with bright sunlight from the left and above, rendering folds of the white, loose robes worn by three of the figures brilliant in its rays, and illuminating the rest of the robes of the woman watching the game of chess. The surface of the stream is rippled at the left, closest to the viewer, and reflects the deep blue of a cloudless summer sky. The right and more distant half of the stream reflects the deeper brown of the far distance, beyond the top edge of the painting. Some submerged rocks and vague forms are also visible under the water. An area of the foreground, in the mid-left, is in shadow cast by another distant and unseen object, presumably a tree. The composition is complex, with five of the figures staggered and slightly out of line along the gentle curve of the bank crossing this unusually wide canvas (its aspect ratio being more typical of marine views and panoramas). Against this are steep diagonals in the middle of the painting, formed by the edge of the brown reflection on the water, the male in the left pair of figures, and the closest female. The cropping of the horizon and any background beyond the immediate meadow and stream gives a sense of space and recession (aided by the foreshortening of the closest figure), despite the proximity of the individuals to one another. The painting consists of a multitude of daubs, strokes, and dabs of colour, those marks composed to provide just enough information for the viewer to assemble them into the whole, which as a result ‘pops’ out in a vivid reality. It is believed that all three male figures were modelled by Nicola d’Inverno, the painter’s manservant, and the woman seen asleep appears to be Jane de Glehn, a friend of the artist. Sargent had purchased the costumes in the Middle East during his travels there, and they were transported in trunks to this site, believed to be the brook at Peuterey in the Val d’Aosta, most probably in the summer of 1907. This painting was hung in the summer exhibition of the New English Art Club, London, in 1909, and was favourably received by the critics. It was sold within an hour of the opening of the press view, to Augustus Healy, founder of the Brooklyn Museum. 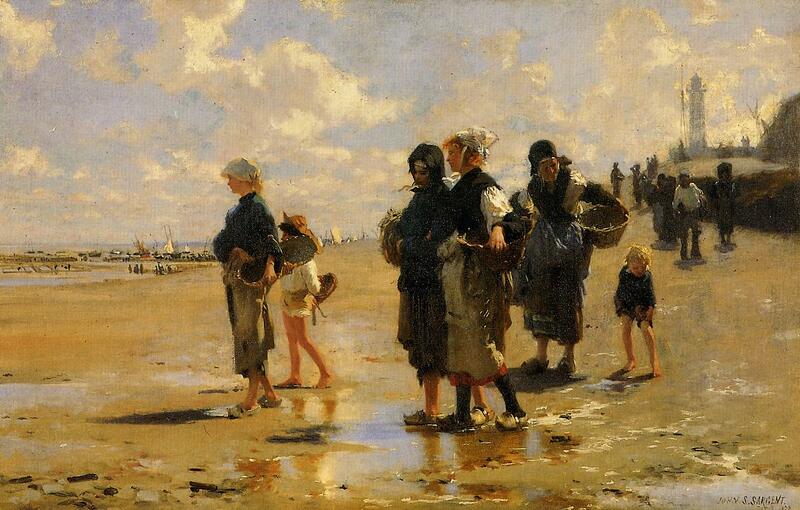 John Singer Sargent, Fishing for Oysters at Cancale (1878), oil on canvas, 41 x 61 cm, Museum of Fine Arts, Boston. WikiArt. Born on 12 January 1856 to expatriate American parents living in Europe, Sargent showed early skill in drawing, and was taught at the École des Beaux-Arts in Paris, and in the ateliers of Carolus-Duran and Léon Bonnat. Although his initial enthusiasm was for landscapes, Carolus-Duran enthused him towards portraiture, and his first major portrait was admitted to the Salon in 1877. His clear talent was recognised by the critics, and he started to travel throughout Europe, visiting Spain in 1879. On his return to Paris, he was commissioned to undertake several portraits, launching his career to become the most sought-after portraitist in Europe. His outstanding painting of Madame Pierre Gautreau (Portrait of Madame X, 1884) brought scandal, and drove him to move to London, where critics were at first not as receptive. 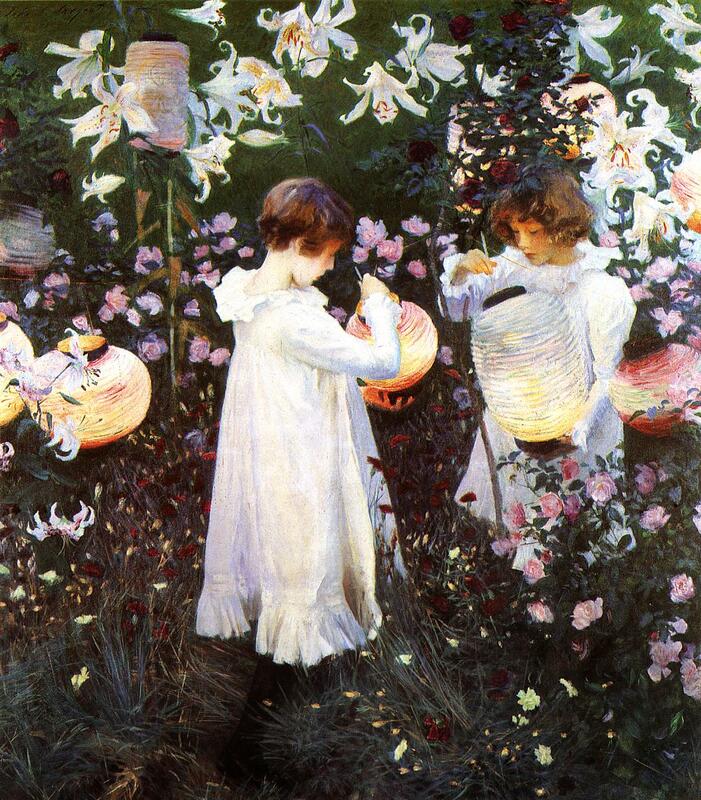 However his Carnation, Lily, Lily, Rose (1887) was very well received at the Royal Academy, and immediately purchased by the Tate Gallery. Commanding huge fees for portraits, Sargent was able to travel widely, and met Degas, Rodin, Monet, Whistler, and other leading artists of the day. He closed his studio in 1907, when he had become tired of portraiture, and was able to concentrate on architectural and landscape painting, particularly virtuoso plein air sketches in oils and watercolours. He was offered a British kinghthood, but declined it, retaining US citizenship. He was a critic of modern artistic movements such as Cubism, for which prominent critics such as Roger Fry were scathingly critical of Sargent, alleging lack of artistic merit. He completed several murals in the Boston and Cambridge, MA, areas, and those in the Boston Public Library are his largest works. At the end of the First World War he was commissioned as an official British War Artist, completing one of the best-known paintings depicting that war, Gassed (1919). He co-founded the Grand Central Art Galleries in New York, and in his later years taught at their academy, the Grand Central School of Art. 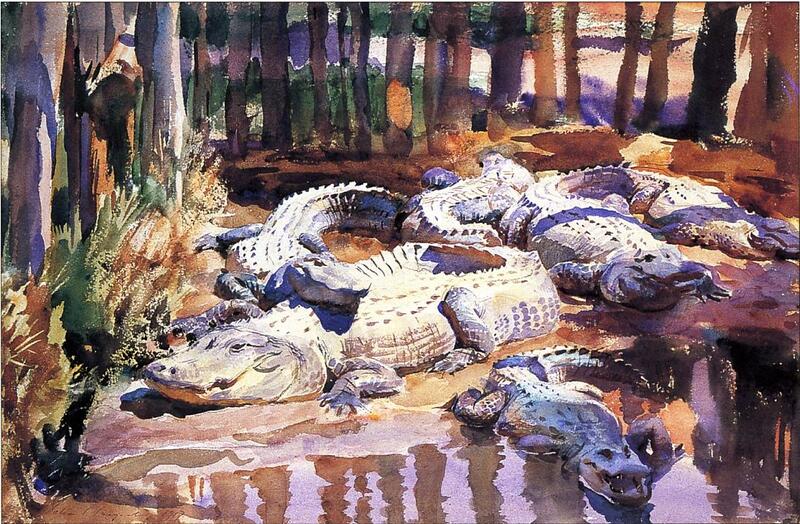 He died on 14 April 1925, having painted nearly a thousand works in oils, and over 2000 in watercolours. 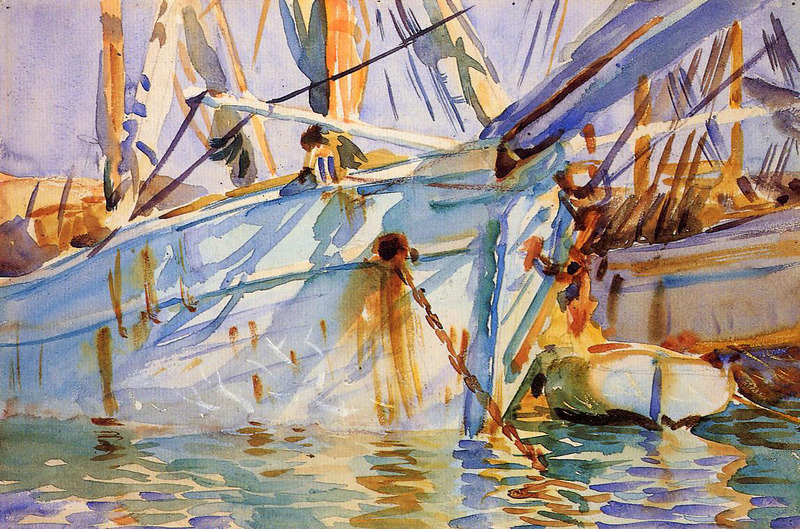 Like Signac and van Gogh, Sargent lived in artistically turbulent times. He started his career at the height of Impressionism, and it ended amid the headlong rush away from realism into the ever-changing ‘isms’ of modern art between the wars. Immensely talented if not precocious, he was able to make a rich living painting portraits of and for the great and the good (and even richer). But he was also a compulsive painter: he simply could not get through a day without applying paint to canvas or paper. Whilst his portraits are superb, and worthy of careful study, I feel that it is his more personal architectural, landscape, and informal scenes which are most revealing and rewarding. Compared to other painters of the day, Sargent’s work may at first appear reactionary, stuck in the late nineteenth century. However careful study of his composition and mark-making shows that he departed significantly from other nineteenth century painters, and his mature style is best considered as post-impressionist, akin to those of Joachín Sorolla y Bastida (1863-1923) and Anders Zorn (1860-1920). Instead of trying to recompose images into something visibly different and decreasingly recognisable, Sargent took the construction of richly realist images to the ultimate limit of making marks. This is in continuation of the developments in the late style of Rembrandt and many subsequent Masters, and not so different from that of Signac in his later watercolours. It also reflected the gestalt approach which was developing among some psychologists in the early part of the twentieth century. He cultivated a style which looked completely spontaneous, building dazzlingly real images from the minimum required bravura marks. 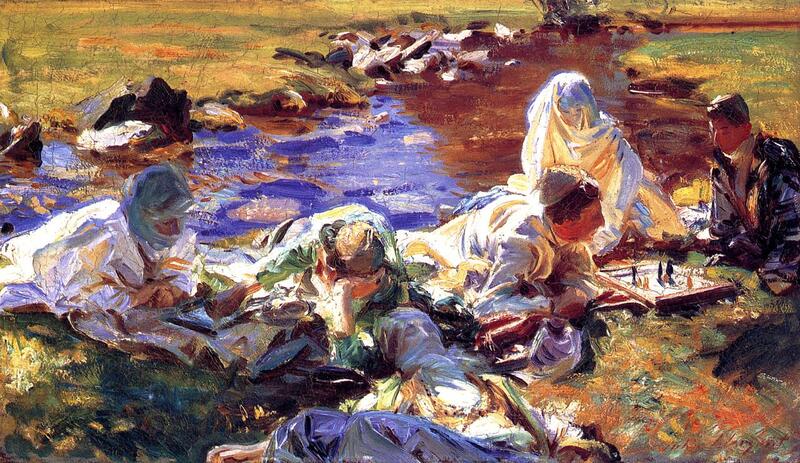 But beneath this illusion of freshness and extemporisation Sargent was the complete professional. He was extremely technically knowledgeable, and in his watercolours, for example, often used wax resist to impart textures and other effects which other painters struggled with. He also used watercolour media to thicken some brush strokes, so that – in conjunction with his lightness of touch in oils – it is sometimes difficult to determine which medium a painting was created in, from appearance alone. Sargent’s marks appear loose and almost haphazard, but again are the product of a thoroughly professional approach, each being formed and placed with great care. When working on a portrait, he was known for sometimes scraping and re-painting repeatedly before he had assembled his marks in just the right way. 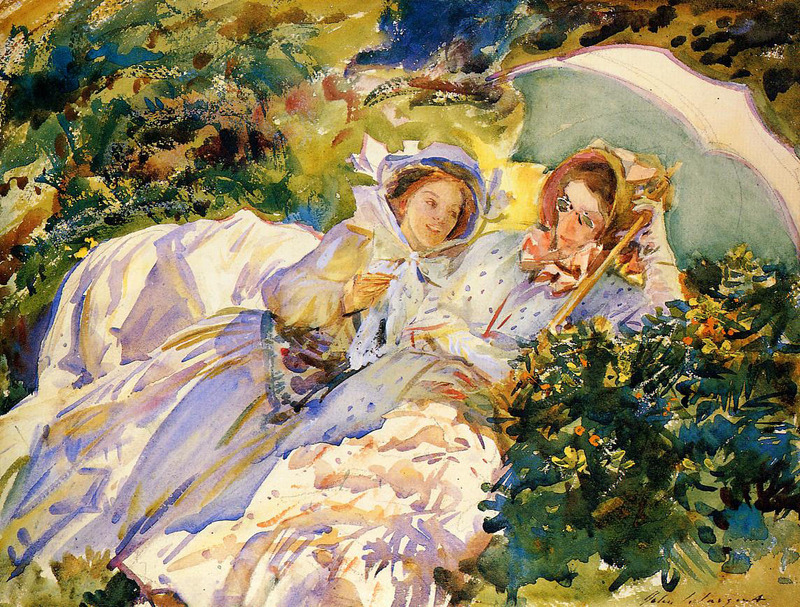 His most characteristic passages often involve whites (shared with Sorolla’s beach scenes), the depiction of folds of fabric (Berthe Morisot), water (particularly his many superb paintings of Venice, following from Turner and others), and the conjunction of rock and water in the Alps (Turner and others again). His preferred subjects included many that were quite atypical of the Impressionists, although he did paint many garden scenes too. Although very popular with patrons, critics, and the public at the time, and successful in exhibiting in the Salon and Royal Academy, the dim view taken by proponents of Cubism and more modern art prevailed during the middle of the twentieth century. This has fortunately changed over the last few decades, when he became a (realist) painter’s painter. 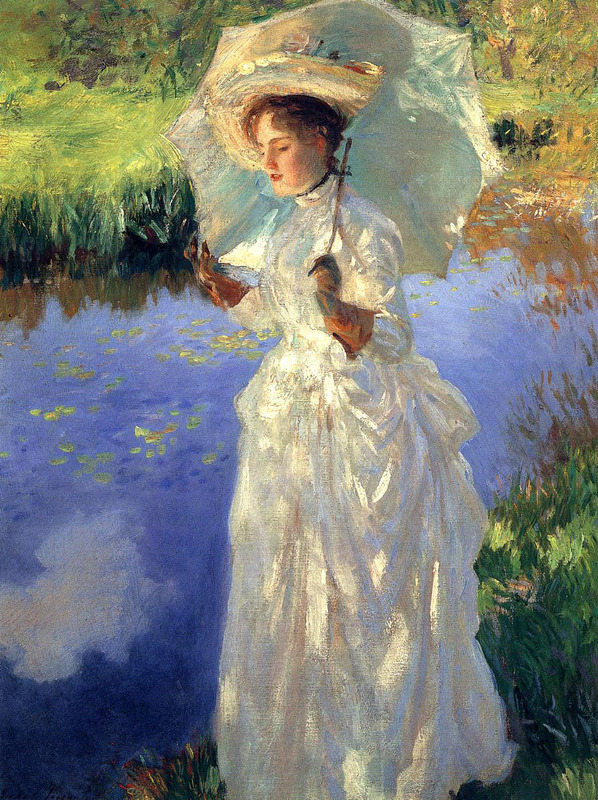 This work is typical of Sargent at his very best, with its distinctive passages of water and white fabrics, rich light and colour. 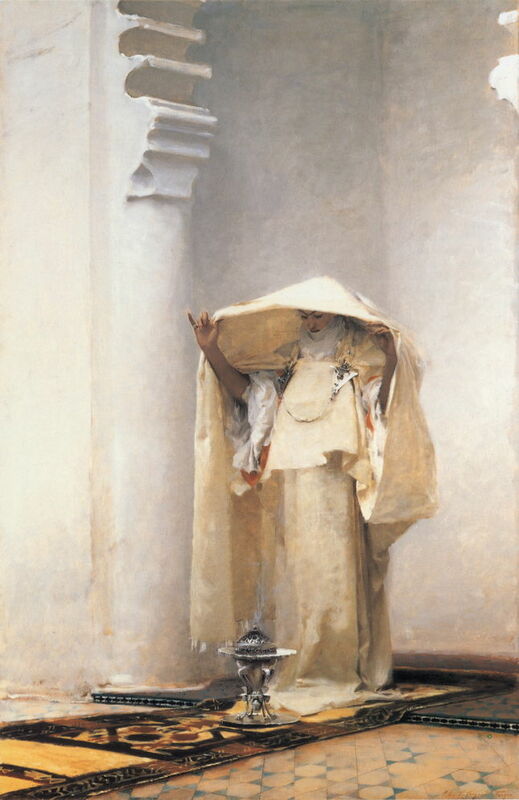 Sargent’s work is undergoing revival, with many modern realist painters identifying him as a key influence on their work. The following are recommended. Posted in Painting and tagged mark-making, painting, Post-impressionism, Sargent, Sorolla, watercolour, Zorn. Bookmark the permalink. Hi, I am so happy you mention the idea that Sargent used Gestalt techniques. However , without an example. 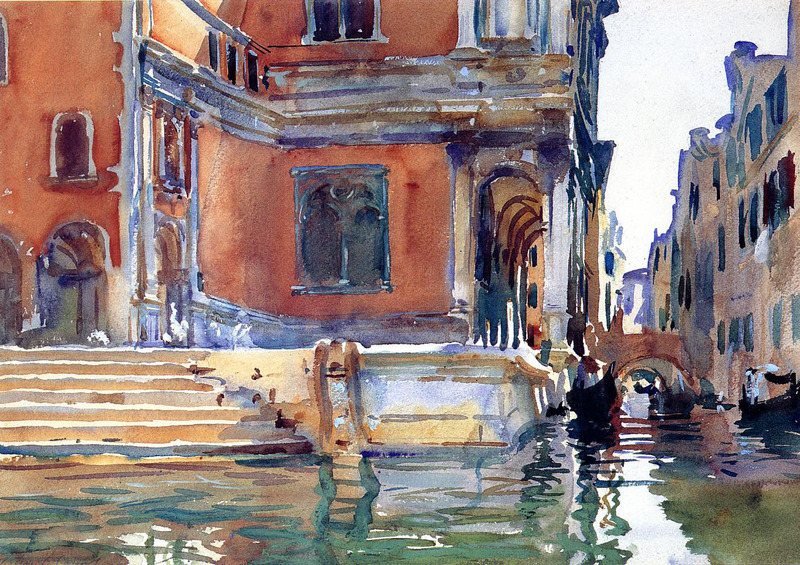 I came to the same conclusion and show how he did this in a video I released ” John Singer Sargent : Secrets of Composition and Design”. Also , even though Sargent did not go in for cubism I do show that he used abstract concepts and not known for such might have really been one of the first abstract painters in a subliminal kind of way. 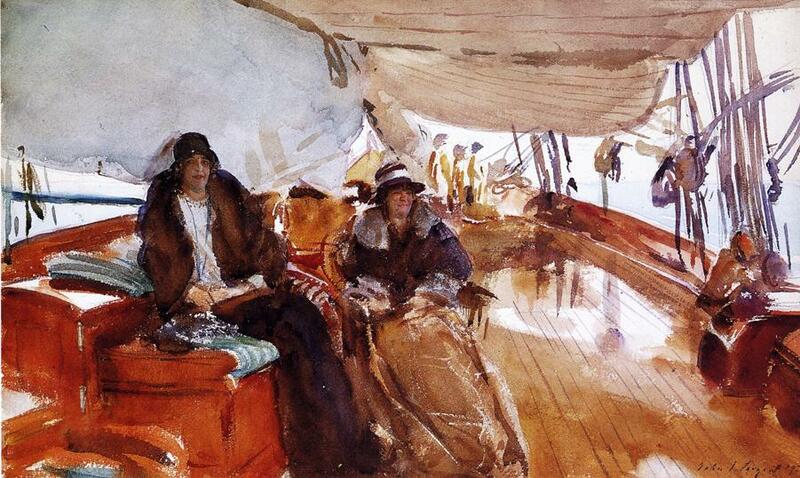 What is really telling is how Sargent was so critiqued by art watchers of his day. He was so far ahead of his time that only recently are we starting to understand what he really did with his art as he himself did not want to or could not explain it.